These two stocks are timely buys right now, but they're also ideal long-term holdings with a huge trend to drive them for many years. If you're in your 50s, you are squarely in the middle of one of the biggest demographic shifts in American history: The baby boomer transition to retirement. Between 2010 and 2029, around 3 million boomers will turn 65 each year, with the end result creating the biggest 65-plus population in history. The 80-plus population is also going to climb, doubling over that period; it is expected that some 40 million Americans will be 80 or older in 2030. This steady, inexorable shift in the U.S. population represents an opportunity for investors, particularly with companies that provide resources that will only grow in demand as America's baby boomers get older. Caretrust REIT Inc (NASDAQ:CTRE), and Welltower Inc (NYSE:WELL) should be very high on 50-something investors' watchlists, offering solid value, strong dividend income, and the prospect of many years of growth as baby boomers transition from the workforce to retirement. The biggest reason REIT stock prices fell sharply over the past year is rising interest rates. Over the past 12 months, the federal funds overnight rate -- which is basically the starting point for every interest rate in the U.S. -- has increased 65% after three rate increases by the Federal Reserve. 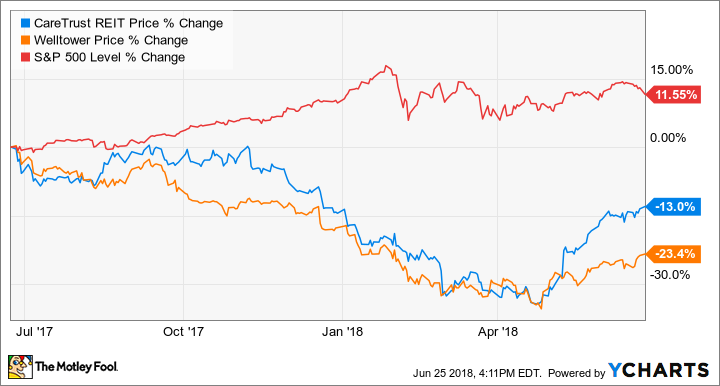 Mr. Market has drawn a line straight between "rising rates" and REITs: REITs typically use a lot of debt; therefore, rising rates are usually bad for REITs. While this is true at a basic level, the market's reaction, which sent both Welltower and Caretrust down more than 30% at one point, seemed over the top. Even if rates continue to climb (and they probably will), I expect the greater demographic trend of aging baby boomers to create far more upside potential than the weight of rising rates on returns. WELL FFO Per Share (TTM) data by YCharts. But this is by design, as the company's management works to execute on a bold strategy to focus on caring for one of the fastest-growing segments of the older population: people with dementia. Welltower has sold off a substantial portion of its hospital, skilled nursing, rehab, and other post-acute care facilities, and it has prioritized memory care, independent living, and assisted living properties. At last count, 72% of Welltower's net operating income came from senior housing, up from 40% in 2010, while reducing NOI from long-term, post-acute care, and hospitals from almost 40% to 11% last quarter. While this transition has made for a bumpy ride for investors, Welltower's strategy to be a leader in this critical area of need should make it a big winner for investors over the next 20 years. While Welltower is pivoting away from skilled nursing facilities to focus on senior housing, Caretrust is taking a different approach during a period of weakness in the nursing home industry. In recent years, there has actually been an oversupply of nursing homes on a national basis, and many facilities have been forced to close, while others have struggled with unfilled beds and weak cash flows, which have made it harder to stay afloat. Considering that the majority of nursing homes in the U.S. are owned by small local or regional operators, this has created an opportunity for Caretrust to aggressively grow and acquire many properties from struggling operators at very good prices. Since going public in 2014 with 92 properties, Caretrust has more than doubled to 191 healthcare and senior housing properties at last count, with almost all of those properties being acquired from smaller, generally privately held companies. 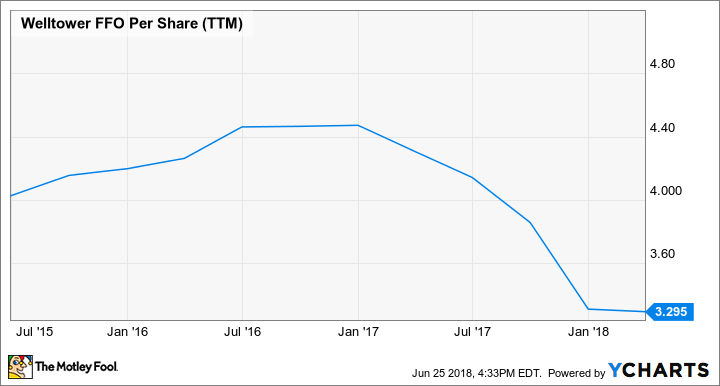 This expansion has helped Caretrust both grow its cash flows -- and quarterly dividend, which is up 64% since inception -- and reduce its risk profile. Only one tenant, The Ensign Group, from which it was spun out, produces more than 10% of its rents, and it has reduced its reliance on Ensign by 65% in the past two years. Furthermore, Caretrust's cash flows should prove to be very secure, with almost 90% of its rents contracted until 2028. This provides a solid measure of predictability for its ability to service its debt and continue paying a solidly above-average dividend. 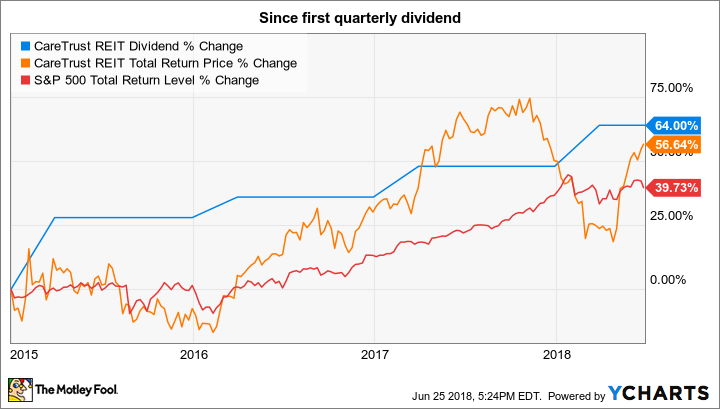 With dividend yields of 5.9% and 4.5%, respectively, at recent prices, both Welltower and Caretrust represent great value today -- so long as they can maintain the payouts, which shouldn't be a stretch based on the cash flows generated from their underlying operations. However, it's not just about those big dividends. With millions of baby boomers adding to the mix of older Americans every year for more than a decade to come, both should make for solid, market-beating long-term investments, not just above-average income investments, as the demand for the facilities these two companies provide expands along with the number of older Americans. And that mix of steady reward from cash flows and solid upside for years of growth should make Welltower and Caretrust ideal holdings in your portfolio.